‘Vedanta Through Stories’ by Swami Sambuddhananda, who was the head of Sri Ramakrishna Ashrama, Khar, Bombay, was published in the year 1950. We are happy to present the reprint of this book after the gap of many years. Spiritual disciplines are necessary for the purification of body and mind. One should study Upanisads and ruminate on Vedantic thoughts. Self-realisation is the aim of human life. “When the mind is attached to sense objects, it becomes impure. When it is detached from sense objects, it becomes pure.” Meditation is the activity of the pure mind when it has been purified by japam & austerity. In human life only, one gets a rare chance to live in the holy company and experience Vedantic truths. The Atman (Brahman) is first to be heard of then reflected on and finally meditated upon. The Atman is existence – knowledge – bliss absolute. “God is the Self of the Universe, the immortal being, The Lord. He is the all-knowing, all-pervading protector of the universe. Let us seek refuge in that effulgent Being, whose light reveals the knowledge of the Atman.” By Self-realisation one attains Eternal Peace and Divine Bliss. Vedanta through stories helps greatly to understand the hidden meaning of Upanisads and the spiritual consciousness will be aroused to lead the life of practical Vedanta. May this book help readers to mould their character for spiritual enlightenment. It was the desire of Swami Vivekananda that the philosophy of the Vedanta should be made easily available to the ordinary man in India and abroad. He believed that the dissemination of the ideas underlying that philosophy among the people would have consequences of great moment, such as diminishing the existing bigotries, prejudices, religious jealousies and unhealthy conflicts, and creating mutual understanding and goodwill between different communities and nations. This book is an humble attempt to popularize the principles of the Vedanta with the help of stories, anecdotes and parables. These have been roughly grouped together in suitable categories, including a few tales and anecdotes of a seemingly secular character which have been added for the sake of variety and also perhaps as illustrating certain significant aspects of worldly life and behaviour. I am extremely thankful to the Hon’ble Dr. Syama Prasad Mookherjee for his kindness in writing a foreword to this humble effort of mine. I am greatly thankful to Mr. K. C. Sen, I. C. S. Ex-judge, High Court, Bombay, now President, Industrial Tribunnal, for going through the typoscript of the book, and to many other friends who were generally very helpful to me in the publication. I shall consider myself amply rewarded if this brings any comfort, solace or message of uplift or of right living to any of my readers. Such is the catholicity of the Vedantic religion and naturally Swami Vivekananda laid great stress on the dissemination of the ideas underlying it among the people. In fact, one of the objects with which the Ramakrishna mission was founded was “to spread among the people in general Vedantic and other religious ideas in the way in which they were elucidated in the life of Sri Ramakrishna.” One thing which has stood in the way of such widespread dissemination of Vedanta knowledge is the lack of a popular, yet authentic version which can be understood without difficulty by ordinary men and women. 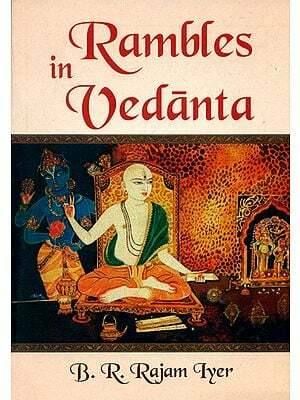 “Vedanta Through Stories” is such a popular version. It seeks to explain and popularize the fundamental tenets of the Vedanta with the help of anecdotes and parables collected from the Upanishads and from the lives of saints and sages, Sri Rama and Sri Krishna, Buddha and Shankara, Ramakrishna and Vivekananda. It is a magnificent attempt and will go a long way in spreading the message of the Vedanta among those who have neither the leisure nor the background to go through different philosophical discourses. SECTION II: Ways of Self-Study.